It's difficult to believe such animal cruelty still exists, but Pit Bull fights continue to be held across the globe. Some people consider it a legitimate sport; others believe it is an abusive practice. What do you think? All the publicity in recent years over so-called "vicious" dog breeds might lead some people to believe dog fighting is only a modern phenomenon, but that wouldn't be correct. Dog fights have been staged for thousands of years for the amusement and profit of people. Records citing the pitting of animals against each other have been found from ancient Rome to Britain to Europe. The practices of bear baiting and bull baiting were highly popular at one time, but the cost of keeping these large animals was very expensive. It wasn't long before men realized it was far more profitable to raise fighting dogs instead, and the dubious sport of dog fighting was founded. Although any dog that is game can be used in a dog fight, Pit Bulls have become the unfortunate all stars of this underground industry. Bred by fight promoters for power and aggression, massive jaws and large teeth, these dogs give spectators the kind of blood sport they seek. 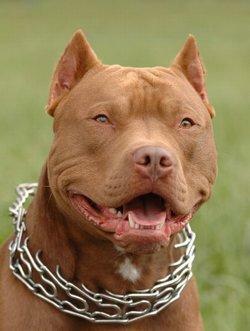 Pit Bulls bred for fighting are conditioned to be aggressive towards other canines. Just like top human athletes, these dogs go through extensive training to build up their strength and stamina before a match. Although keepers like to keep their exact methods to themselves, the dogs are generally road worked on treadmills, taught to chase and attack bait animals, and fed dietary supplements to strengthen them. A dog and its keeper will spend many hours together building an intense relationship that will culminate in the fighting pit. Pit Bull fights aren't just for entertainment; they are money makers for most of the people involved. Bets are placed before a match begins, and plenty of money will exchange hands by the end of the fight. Typical fights match up two dogs of like size, weight and condition against each other. These dogs, their handlers and a referee all gather in the ring as the opponents take position on either side. Once the referee gives a command to release the dogs, the fighting begins. Since these dogs are raised to spring immediately into action, Pit Bull fights are quite different from the typical tussles you might witness between pet dogs. There is no growling and posturing over territory, and no display of dominance. They simply launch at each other and begin to tear away at each other's flesh. Throughout the match, the keepers occasionally pick up their dogs and reposition them as the fight continues. This is rather amazing considering the amount of violence taking place. Ordinarily, these dogs never bite their humans in the ring. This is because any Pit that shows aggression toward its trainer is eliminated from the program. Dogs that are not automatically euthanized sometimes end up in pet homes, but this typically only occurs after an individual Pit has been evaluated and conditioned to being around people in a normal home setting. Every time the dogs are broken up and released again, they must cross over a scratch line determined by the referee. If one of the dogs fails to cross the line and re-enter the fight within a set amount of time, the other dog is declared the winner. Although most keepers maintain that they do not fight their dogs to the death, the reality of the situation is that, win or lose, many Pits are severely mauled during a match. Some keepers take steps to care for their dog's injuries while others who judge a dog too injured to fight another day will not attempt to provide any first aid. Keepers who consider themselves merely "sportsmen" will often deny this unpleasant fact, but there are hundreds of cases of Pit Bull seizures where the dogs were left by their owners to die in horrific conditions. Some of these dogs recover with professional care; others cannot be helped. It boggles the mind that anyone could look at what these animals go through and still call dog fighting a sport, but that is exactly what occurs. Pit Bull fights and for that matter all staged dog fights, are considered felonies across most of the USA, yet the industry continues to thrive under a veil of secrecy. Although there is sometimes a misconception that dog fighting is only an activity engaged in by the poor, the uneducated and career criminals, this is simply not always the case. Consider the controversy surrounding Atlanta Falcons' quarterback Michael Vick. Here was a man who appeared to have it made, and yet he was accused of running a dog fighting operation from his Virginia home. His future appeared as though the sky was the limit, but his career was put on hiatus after admitting his participation in dog fighting. He was subsequently convicted of the crime and served prison time for it, although he eventually returned to the NFL. Although many municipalities have attempted to eliminate dog fighting through breed-restrictive legislation, these measures simply haven't brought the desired results. Unless fight keepers are identified and prosecuted, they will continue to breed, train and fight more dogs. Pit Bulls, like any other type of dog, require early socialization and training to make them the best companion animals they can be. This responsibility rests with every breeder and every owner.